Will Ankylosaurus get the last berry? This is the second epoxy model I've posted on this forum and I'm almost finished! 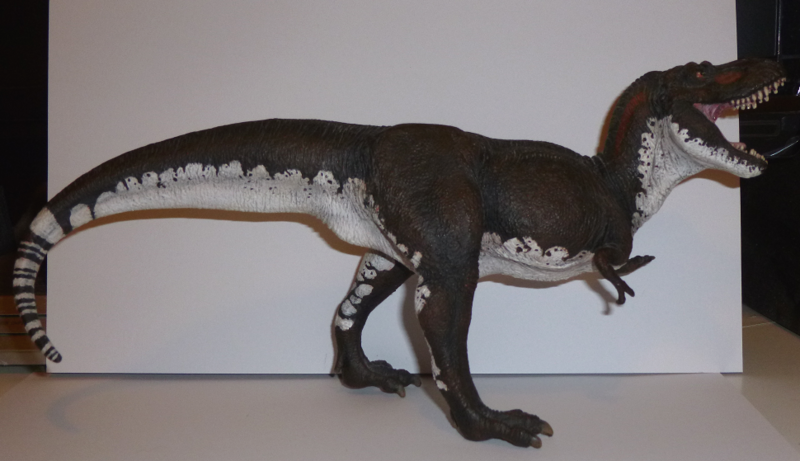 I started this iguanodon because I was given this inaccurate K&M toy that was driving me crazy! I decided to just "modify it". It turns out the toy was beyond any hope of modification so I basically used it as an armature. 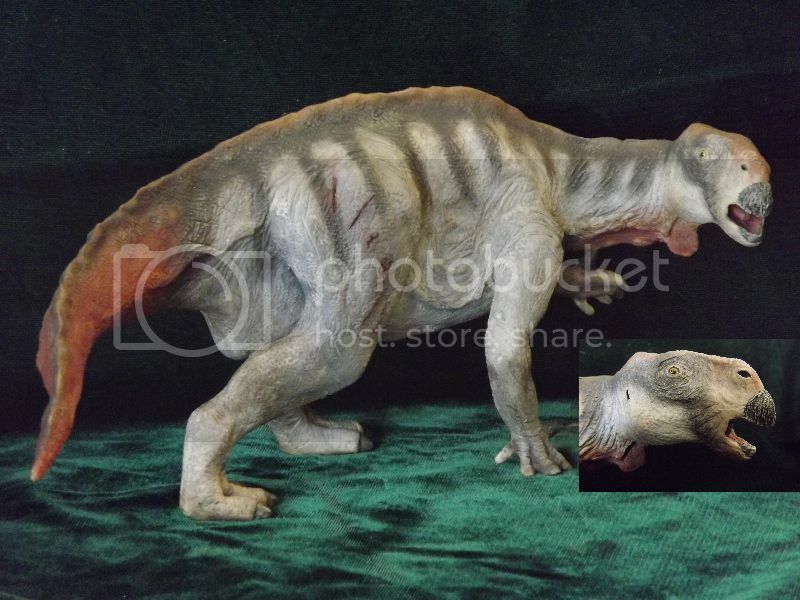 Re: Iguanodon sculpt & more! Here is the iguanodon next to my Centrosaurus. The Centro is 1:30 scale and the iguanodon came out close to that. I would greatly appreciate feedback on accuracy! I will still do finishing touches and fill ruff spots. I would like to try casting these as toys. An interesting way to sculpt! I like em'! Very nice work I am enjoying looking at your different sculpts, I use epoxy clay to sculpt as well. By the colour I am guessing you are using Apoxie is that correct? I have tried that brand but I found Magic Sculpt gave me better results for detail work. On the Iquanodon as well as beefing up the ankles as has been suggested if you can get a hold of this paper. Wright, J. L. (1999). "Ichnological evidence for the use of the forelimb in iguanodontians". In Unwin, David M. Cretaceous Fossil Vertebrates. Special Papers in Palaeontology 60. Palaeontological Association, pp. 209–219. ISBN 0-901702-67-6. Wright concluded by examining trackways ascribed to Iguanodontids "that when walking quadrupedally , iguanodontids, at least occasionally, placed their hands on the ground outside the line of tracks made by their feet, with the dorsal surface of the manus facing outwards parallel to the trackway midline." All you need to do is turn the lower arm outwards to achieve that pose, if you wish. By the way when your sculpting skin texture on epoxy what is your method of making scales?? I have been rolling a clay ball with holes in it over the parts of my model where I have put epoxy and it's worked ok so far but I think I can do better (and the ball is starting to fill with epoxy residue). Wow! I just saw all the dinosaurs you did for safari! Those are wonderful! I looked at photos of your Gryposaurus as I sculpted my Iguanodon (hopefully that isn't to obvious) I would love some tips on how you do your scales! On your larger models and on the toys, they are all so great. Actually the safari line are the only dinosaurs I can find here where I live. 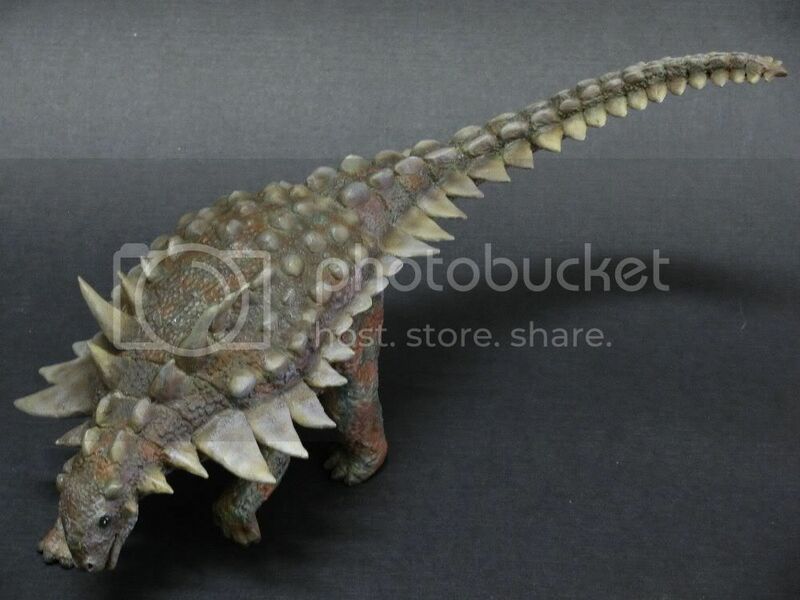 I was just admiring them yesterday at michaels as I got some paint... For dinosaurs of course. What a beautiful sculpt! I use Super sculpey for making my dinos - but I think I'm gonna give a try to what Doug suggested. Can't wait to see the whole family finished! "From the North came the furry Tyrannosaurs"
Dinosaur: Wangchungasaurus or maybe it was Yangchuanosaurus, can't remember. Is either one real? Nice sculpts. Reminds me of one I did about 15 years ago. Aside from the Iguanadon's hand rotation already mentioned, you might give them external ear openings. I don't know if they would be like a bird, fairly open or like a crocodilian which has a flap partially covering the opening. The best way I have found is to make individual miniature cookie cutter style metal stamps on the end of a handle and do each scale one at a time. For the Gryposaurus I made one with multiple scales because they were so darn small but for most like the Nasutoceratops I probably had about four different ones that I was switching back and forth with. It is very time consuming but I find it is more effective than a texture stamp. I was trying to remember what I didn't like about Apoxie and you just reminded me it was too elastic and especially too tacky. I do a lot of mammals and birds for Safari Ltd as well and the Magic Sculpt is a lot better for hair lines and feathers. I use water with my tooling as well to help my tools slide and form the material. As for following my Gryposaurus I am glad it could help. When I was learning how to draw I would just grab household items and do sketches of them to practice so if looking at one of my pieces helps you I am honoured. Good idea for ears! I forgot about ears after deciding to skip em on the Centro. You wouldn't happen to have a 15 year old photo of yours would you ? I would have been 2 years old I don't think I've seen any of your work. That would be real neat. This one is the quickest I could find. If I did it today there might be a few things I would have done differently. Here's another one from 15 years ago. These are done using Sculpey polymer oven bake clay. For me I started out doing my own sculptures like you but I was using natural sculptors clay, then I took a Museum Technology course, worked in a museum model shop for 17 years and worked as a freelance sculptor for 23 years, I was exposed to a wide range of materials and techniques working in the model shop but these days with the internet their are lots of people sharing technique online. Great job on your sculpts! I use Magic Sculpt too. For making the body form or sculpting fur, I like to use a 50/50 mixture of Super Sculpey and Sculpey III. To make skin details, I coat the Sculpey with Magic Sculpt. But, I like reading about other sculptor's techniques to get ideas and inspiration. Wow, I'm impressed! Those are really neat!! I'm looking forward to doing more skin details like yours, I think I'm going to have to try a different material though. This free form earth stuff is very elastic. I love the hands on your Iguanodon! They really show the weight being spread through the digits. How did you do the scales on the top of the Gastonia? ?